There’s more than one way to skin a cat. Or make medicine, for that matter. It all depends on the kind—tabby or calico? Small molecule or biologic? One key feature that distinguishes biologic drugs such as monoclonal antibodies from small molecule drugs such as aspirin is their production. This highly complex process, biomanufacturing, requires much more time and expense than needed for small molecules. In this two-part WEEKLY series, we’ll revisit key components of biomanufacturing. First, we look at cell bank production and examine the different types of cells used in biomanufacturing. 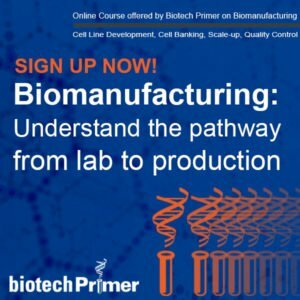 Next week, we zoom in on the step-by-steps of biomanufacturing. Biomanufacturing is the production of biological products from living cells. 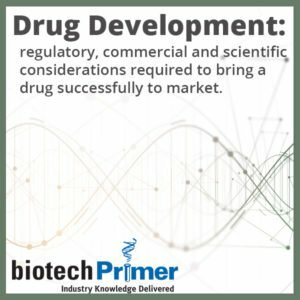 Companies use the process to make biologic drugs such as antibodies and enzyme replacement therapies. Small molecule drugs can be synthesized chemically. As their name suggests, biologics require living cells. Biomanufacturing isn’t just about medicine though. For instance, companies use the process to make enzymes for bioremediation—that is, cleaning up toxic stuff in the environment. The food processing industry also uses biomanufactured products. First things first. Biomanufacturing involves engineering a cell to produce a specific protein. Using well-established techniques, scientists transfer a gene encoding the desired protein into a “production cell.” The two most commonly used production cells are E. coli bacterial cells and Chinese hamster ovary cells, or CHO cells. Once a manufacturer successfully manipulates a cell to produce said protein, the cells multiply. Scientists call these genetically identical cells the production cell line. Step two is for the manufacturer to establish a master cell bank that supplies genetically identical cells for future products. 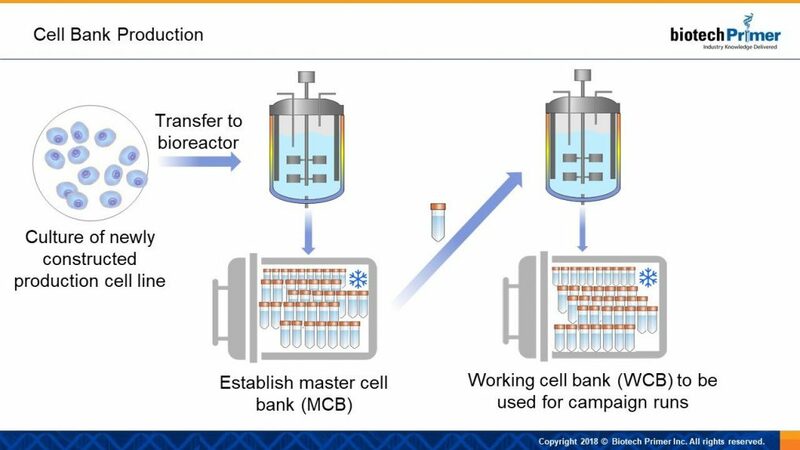 Companies create cell banks by transferring the production cell line to a bioreactor. Though they may sound scary, bioreactors are simply vessels filled with a growth medium — a “broth” with the required nutrients brewing in optimal conditions of temperature, pH, and oxygen concentration for cell growth. The cells are left to simmer, or multiply for a few generations, creating hundreds of millions of identical copies. The manufacturer collects this slough and portions them into small vials. Each of the several hundred receptacles contains about a million (million!) cells. The vials are then frozen with liquid nitrogen, cooling them to -196 degrees Celsius. The deep freeze stops cell growth; In other words, if some future scientist thawed one of the vials in twenty years, she or he would find the cells inside exactly as they were at storage—barring apocalypse or someone tripping over the power strip. This stable longevity is key, as product consistency over the lifetime of the product is critical to drug safety. 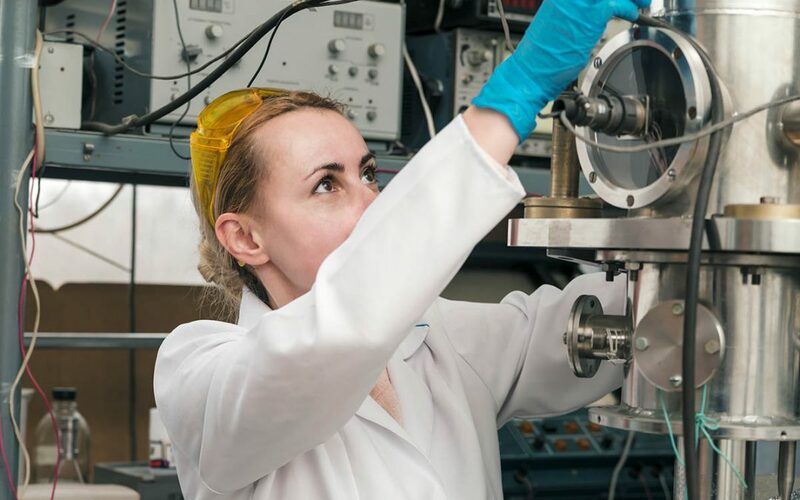 Manufacturers typically divide the master cell bank for storage in three separate locations so that disaster in one place doesn’t wipe out this important resource. In each location that a product is manufactured, a manufacturer creates a working cell bank by thawing one vial from the master cell bank and “expanding it,” or allowing it to multiply for a few generations — and then freezing several hundred vials for storage. Each new biomanufacturing campaign starts by thawing a vial of cells from the working cell bank. The first biologic drug, insulin, was produced using E. coli cells. Researchers soon realized, however, that they couldn’t produce every therapeutic in bacterial cells. Highly complex proteins, such as monoclonal antibodies and certain enzymes, present two main obstacles. Bacterial cells are unable to correctly fold these complex proteins, nor are they able to confer required post-translational modifications – chemical and physical changes made to a protein by cellular enzymes after the protein is produced. Life-saving drugs grown in E. coli bacteria seems a bit sketchy, does it not? The same bug that causes food poisoning? Not exactly. While it sounds unsavory, it’s important to remember that there are many different strains of E. coli, most of which are benign. In fact, E. coli bacteria make up a big chunk of healthy gut microbiota. Why Chinese Hamster Ovary cells? Well, since you had to ask… When scientists first realized they needed some cell type other than E. coli to produce complex biologic drugs, CHO cells were handy. Scientists worldwide were already using them in many experiments and they made a convenient platform for biologics. More than thirty years of data has made it clear it’s safe to produce drugs in these cells. As a result, the FDA has granted them “generally-regarded-as-safe” (GRAS) status for therapeutic protein production. That is, drug companies can use them to manufacture product without first demonstrating their safety. Of course, it’s important to remember that no matter what type of cells are used to produce the therapeutic protein, the “nursery” cells don’t make it into the final product. After manufacturers grow therapeutic protein-producing cells for several days or weeks, the next step is to purify the therapeutic protein away from other cellular proteins and the cells themselves. Look for more in Part 2 of this series next week!